I remember the day she was born, nearly fourteen years ago. I would be responsible for her sister, Cassie, but only for a few months. Christine’s human mom — we were all learning to train service dogs — held her when she was only moments old and became her trainer when Christine was seven months old. The two formed a solid bond and became a permanent family a few months later. Christine was one of the last puppies in the litter. It was a dramatic birth. “My” puppy wouldn’t stop bleeding from the umbilical cord. One of the other students, an EMT, stopped the bleeding. Then one of the pups was not breathing. The same student tried to save the tiny puppy, but she didn’t make it. There was an orientation going on in the next room for volunteers who would help socialize the puppies. Each student had a part in the orientation, and we had to run back and forth between the whelping room and the room filled with people. Christine’s mom, Ideal, an special dog who raised many successful service dog puppies, stayed calm despite all the drama. Christine was fine, though, wonderful even, right from the start. She had pretty much the perfect dog life. 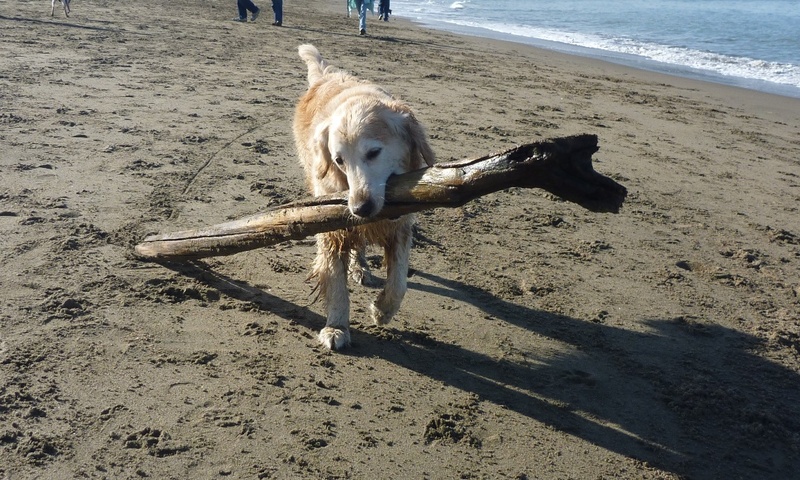 Her devoted mom took her to the beach pretty regularly, and they went on great hikes and walks in San Francisco every day. She had the best food and treats. Dozens of toys. When we all got together, Jana and Cali sure knew which mom to beg for treats. Not their mom. Christine showed Jana the ropes at Fort Funston and at our favorite — Crissy beach. She liked to speak softly and carry a very big stick. She loved to play and sniff out gophers. Jana loves to roll in the sand. Lucky for her mom, Christine didn’t do that. She slowed down a bit as she hit her teens, but she was always a sweet, friendly, happy girl. 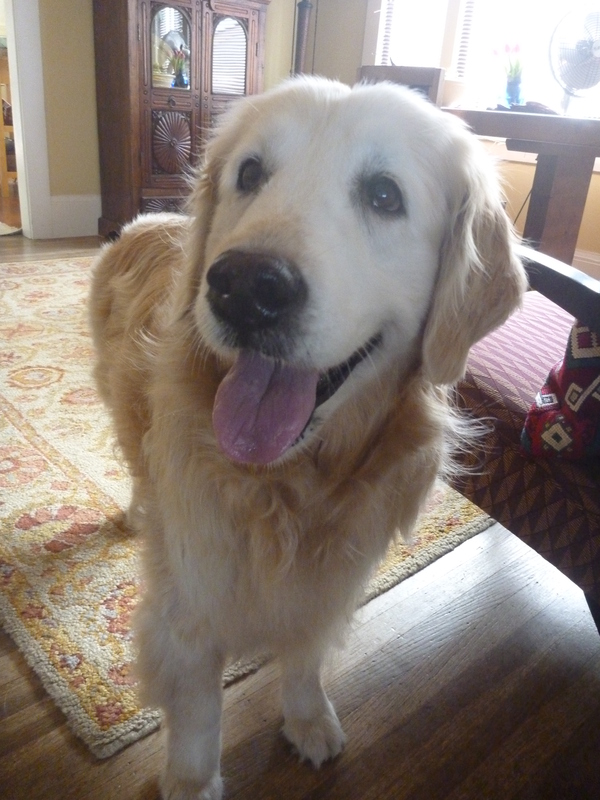 In the end, as it often is with golden retrievers, Christine was diagnosed with cancer. She carried on for six months, but eventually, she could go no farther. Wherever great dogs go, she’s in good company. I can’t even list all of the wonderful dogs my friends and family members have lost in the last year, let alone all the wonderful dogs who’ve touched our lives. Sometimes, cancer takes a dog very suddenly. Christine, as our Oriel did, gave us time to prepare. But either way, no one’s ever ready, and there’s never enough time. Thirteen and a half years, a full life for a golden retriever, is far too little time to have with a beloved friend and companion. We miss you, Christine. I have a 3 1/2 y.o. golden retriever, Pippin. He is number 1985 out of 3000 dogs in the Golden Retriever Lifetime Study, sponsored by the Morris Animal Foundation. The hope is to determine how environment/lifestyle, etc impact a dog’s life. Are they overly medicated? Is it chemicals in the grass, and so on. I have had seven Goldens, and adored them all. I certainly feel your pain. Cali, who is about to turn 4, is also in the study!